The Jim Henson Company has bought a pitch for an IDEA for a new Muppet movie. David Stern ("Gepetto," Wonderful World of Disney) will write and Stephen Schwartz (The Hunchback of Notre Dame) will compose the music. 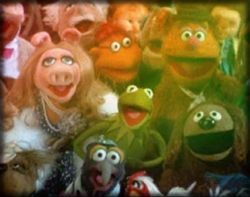 The idea is about the Muppets (playing themselves) are living the high life in Hollywood until Kermit decides they've lost their purpose in this greedy world. So he takes them all back to the swamp. The deal was brought into Henson by Christine Belson and Tim Gray, with Corner of the Sky's Dave Phillips and Endeavor selling the deal.